A family receiving rental assistance from the State of Connecticut is accused of causing extensive damage to several of the homes they were placed in. 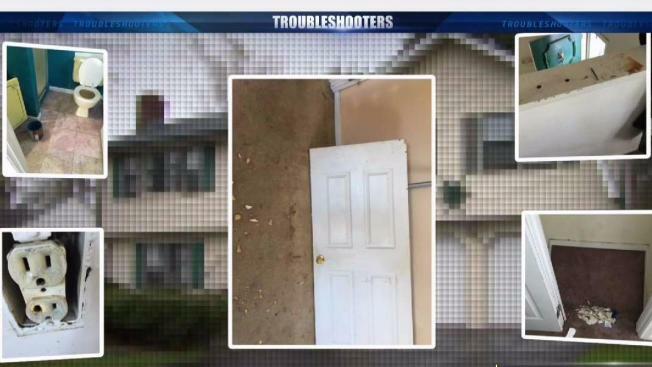 The NBC Connecticut Troubleshooters spoke to three landlords in West Hartford and one on East Hartford about their experiences working with the Department of Mental Health and Addiction Services (DMHAS) and one particular tenant. Laura Guilmartin said she was contacted by a DMHAS employee in 2016, who said his clients were interested in renting her home near Bishop’s Corner. The clients were a family of eight enrolled in the Shelter Plus Care Program, which is funded through a federal grant. The program provides housing and support services to homeless clients with a history of psychiatric disability, substance addiction, or who are HIV positive. Guilmartin said she had some concerns about renting to a family with six children, but believed signing a lease with a state agency offered a certain level of protection. As a result, Guilmartin said she did not conduct her usual background check. “I never imagined that the state would allow them to destroy my home,” she said. DMHAS paid Guilmartin $2,000 a month in rent on behalf of the family. Guilmartin said she only went inside the house twice while the family was living there. Most of the problems she noticed were on the outside. The Troubleshooters obtained copies of seven citations that were issued by the West Hartford Zoning Office during the family’s tenancy in Guilmartin’s home. The violations show the family failed to obtain a permit for a temporary pool, and did not have the required fencing around it. There was also a large boat in the driveway and goats and roosters in the backyard. The fines totaled more than $4,000. Guilmartin said the citations were addressed to her, but mailed to the rental property. She said the tenants never told her about them. She learned about the violations when she called Town Hall to ask if the tenants needed to move the boat. Eventually, Guilmartin told DMHAS she wanted the tenants out of her home. After they moved out, a DMHAS employee conducted a walk-through of the home with Guilmartin. “It was overwhelming. There was bleach thrown on the carpets,” said Guilmartin. “All the doors were broken, all the appliances were broken. The walls were brown from the garbage [they burned] in the fireplace,” she said. Even the doorbell was ripped out, she said. In addition, Guilmartin found furniture piled up in the bedrooms and garage that she says was too heavy to remove on her own. She had to chop it up and toss pieces out of the window into a dumpster. Guilmartin said the DMHAS employee who conducted the move out inspection initially told her DMHAS would pay for the damages. But the next morning, she said DMHAS told her it would only pay $4,000, significantly less than she says it will cost to cleanup and repair all of the damage. Connecticut law also entitles the landlord to keep the security deposit. Guilmartin said DMHAS pro-rated December’s rent because the family moved out early in the month. After she complained, DMHAS paid her for the remainder of the month. The Troubleshooters have learned this family has a history of similar behavior. We tracked down their previous landlord in East Hartford who had a similar experience with the family. He asked not to be identified but told the Troubleshooters by phone that the tenants were the worst he’s ever had and that he ended up evicting them. He said he spent $20,000 to fix up the home in order to sell it. The landlord also expressed remorse that he was unable to warn Guilmartin before she entered into a lease with the tenants. As for Guilmartin, she found out where the family moved after they left her home, and contacted that property owner, Dritan Dalipi, who lives in California and owns a home in West Hartford. Dalipi told the Troubleshooters he was contacted by a DMHAS employee who saw his rental ad online. According to Dalipi, DMHAS told him upfront how much it would pay for any damages the tenants caused. Although Dalipi said he did ask for references, he said he did not receive them. His real estate agents reviewed the lease before he signed it. Dalipi said entering into an agreement with DMHAS gave him a false sense of security. “It didn’t take more than two months for [the tenants] to turn everything upside down, making me evict them,” Dalipi said. Dalipi has a strict no pets policy. It is spelled out in the lease and Dalipi said he also discussed it with DMHAS before agreeing to rent his property to the clients. He later learned the family had cats, fish and dogs. When he asked them to rehome the pets, Dalipi said the family refused. He agreed to let the pets stay for an additional fee. Dalipi said the tenants again refused. He told DMHAS the family was no longer welcome in his home. “This was the only thing I wanted to avoid. Dealing with eviction, dealing with repairs, dealing with damages,” Dalipi said. Dalipi said he spent a week cleaning and repairing what he could himself. He hired professionals for the rest. Dalipi presented DMHAS with a tally of repairs and lost items. It includes items he claims the tenants stole. He also filed a theft report with the West Hartford Police Department. The report shows an officer located two of Dalipi’s dressers in the family’s new home and ordered the tenants to return them. The Troubleshooters also asked DMHAS why the clients have not been kicked out of the program. The agency did not answer. A representative for HUD told the Troubleshooters the Hartford Field Office received a complaint in January from a West Hartford property owner concerning damages to the home. Guilmartin and Dalipi said by continuing to assist the clients, DMHAS is encouraging their behavior. “They shouldn’t have even placed them in my house with their history,” Guilmartin said. “I feel bad for the next guy. And for the next one. And for the next one,” said Dalipi. The family moved out of Dalipi’s home in March. DMHAS found them another home in West Hartford. The Troubleshooters have learned that the landlord at that home has started the eviction process.